Have you seen YouTube lately, staying on the site for longer than the three minutes it takes to watch the video link that a friend emailed? Chances are the answer will be no. Lady Gaga’s ‘Telephone’ video shown in Leanback, which offers bigger fonts and a layout that’s easier to view away from your computer. Though YouTube calls itself the third most-visited site in the world (after Google and Facebook), it works like an efficient courier service, playing content for you wherever you are on the Web, including Facebook, Twitter and email instant messages. But while we’ve been busy watching YouTube videos elsewhere, the site itself grew up. YouTube has things like personalized channels, more editing options for uploading clips and a full-screen mode for sitting back and watching videos. A lot of these extra features are buried on the site and difficult to find. I took a deep dive into YouTube, compiling a list of handy shortcuts for navigating this video hub and getting more out of it. Sharing videos with friends is one of the most popular uses for YouTube, but sometimes you want to share just the best part of a video. With two clicks, you can trim videos to begin exactly where you want and then share them. As a video is playing, right click at the point where you’d like your video clip to start and select “Copy video URL at current time” to get a URL for the trimmed video. When others open the link, it will start right at the spot in the video where you right-clicked. No longer will a video clip take too long to reach the best part, like waiting for a model to fall on the runway, and leave you hesitant to share it on Facebook or via emails with friends. Searching for music on YouTube can be exasperating since so many people upload videos of themselves singing and tag the video with the name of a well-known musician. So while you’re looking for the latest Coldplay song, you find a high school band covering the song instead. To find artists who do publish on YouTube, look at youtube.com/disco, where users can type in artist names to get a playlist of videos by that artist. In regular YouTube search results, the official stamp from YouTube (and wording) signals that an artist is verified—much like the blue checkmark beside popular Twitter users who are truly who they claim to be. 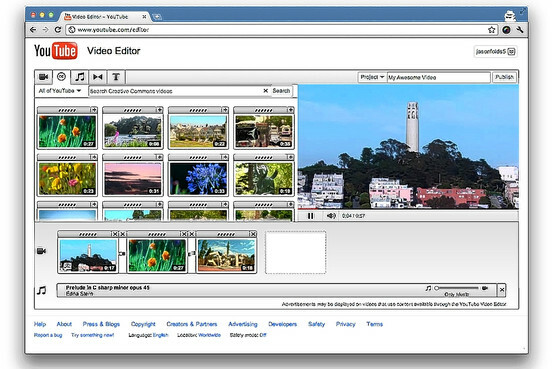 With Video Editor, users can edit existing videos or upload new ones. If you’ve ever recorded a video shot in portrait mode that you’d rather share in landscape or vice versa, the video can be switched to the correct viewing angle, saving viewers from tilting their heads to one side to watch. Do this with YouTube’s editor in the cloud, youtube.com/editor. Here, people can edit (including rotate) existing videos or upload new videos. Content can be mixed in with other video clips from the Creative Commons site, soundtracks can be added by choosing from a selection of music, and text slides can be dragged in to display between video clips. To see all of YouTube in a much more handsome layout, try Leanback, found at YouTube.com/leanback. This opens a page that’s meant to be viewed far from your computer, complete with a black background and white text written in large font. Recently, it became possible to log into YouTube using your Google account username and password (Google has owned YouTube since 2006). Using their Google account, users may browse YouTube, rent a movie and “like” a video. To upload their own videos, subscribe to a channel, make comments on and “favorite” videos and get recommendations from YouTube on content they may like, people must create a YouTube account and use that in addition to a Google account. A site called TestTube, found at youtube.com/testtube, holds many in-the-works projects from YouTube engineers. Here, users can kick the tires of some features that aren’t fully baked. One example is YouTube/slam, which pits one video against another and lets viewers vote on the best one. It’s important to know the sharing settings in YouTube. There are three: public (anyone can search for and view); unlisted (anyone with the link can view); and private (only people who you choose can view). Any video can always be taken down from the site by its original publisher.